The Stencil Library has designed a repeating stencil with rather super little bats all over it. Well, it is the season. The great thing about it is that it looks a bit abstract. Almost like a fractured zebra stripe, but when you look closely, you realise it is loads of little bats. So if you fancy a bit of Victorian goth in your decorating, this can work year round. Or of course, you can use it on seasonal decorations or outfits. This is a petite stencil so is good on furniture and small items, but as an allover repeat can cover large areas too. You can use it as a border or pull out individual bats for a random scattered effect. As with any of our designs, we can usually make custom sizes too if you want a bigger sheet or bigger scale. As is, this measures (sheet size) 8 inches (20cm) tall x 7.5 inches (19cm) wide. To help with scale, the largest bat has a wingspan of 3 inches (7.5cm). Normally this stencil costs 10.00 GBP (+postage if applicable), but you can have it at 8.00 GBP (+postage if applicable) until Oct 31, 2017. This is a newly designed special stencil and is not on our site yet, so orders can be taken directly. Just email us with your full shipping address requesting the Mini Bats stencil and we will send you a PayPal invoice. Or you can phone us and pay with a card. A piece of woven fabric provided the inspiration for one of my favourite stencils; GMT54. Here are some of the ways that I have chosen to decorate surfaces with this stencil. and these jeans were stencilled with GMT54 to match their beaded trim. I stencilled the fabrics with a mixture of Lumiere and Liqutex paint. If you have the time look at my video showing fabric being stencilled. Other clothes stencilled with GMT54 include a black, silk and viscose shirt which I stenciled with Fiber Etch to make devore pattern. The etch was applied through the stencil onto the velvet side of the fabric then the stencilled pattern was heated with a hair dryer before the whole garment was given a scrub under running water. The stencilled pattern burnt away the velvet plush revealing the sheer, silk layer below it. The other half of the same garment is stencilled with discharge paste which takes away colour. Once the colour had bleached to a pale gold I dropped silk paint over it and let the colours fall and blend where they wanted. Here I am wearing it. I have used the same techniques on this silk/viscose scarf. It was white and once I had dyed it I set about etching and bleaching through my stencil. A completely different look with the same design was achieved by stencilling the GMT54 design with acrylic paint onto aluminium leaf. I had a larger version of the GMT54 gothic stencil made to decorate a tent in my garden. The tent was made from canvas tied to a wood frame. I used Ivory black acrylic paint from Liquitex, I sell this paint at The Stencil Library and find that it withstands the British weather very well. Also, it is machine washable on fabrics. So, if our GMT54 design has inspired you to stencil follow the links to find out more or to order one for yourself. A Collection Of Gold Star Stencil Projects. Stencil decoration can be can be applied in any colour but it seems I have only gold stars in my photo archives. However that seems quite apt with the festive season upon us. Armed with fabric, a star stencil and gold paint one can create ritzy table coverings in a few hours. as well as walls and ceilings. This opulent home theatre is the work of Inga Belozerova with Michelangelo Decorative Painting. They have an international business based in New Jersey USA. Visit their Facebook Page to see more of this and other fabulous projects. ...and this is the work of Rachel and Julie using the same stencil of stars in a Stencil Library pop up shop in Ikea. and I stencilled stars onto blinds, fabric and a bath tub. All projects used the CS58 8 point star repeat from the Cover Story Collection in the budget stencil section at The Stencil Library. My stencil of the week is DE31 It is an arts and crafts style border that hangs beautifully from ceilings, chair rails and the fronts of wardrobes. I have used in two of my rooms at home. I used it on one of three stencilled kimonos that were made for a guest room. I employed a mixture of matt and metallic acrylic paint to stencil the fabric. They are both washable. A smaller version of the same border was stencilled onto panels of clear acrylic and then I gilded behind the design with Dutch metal transfer leaf. The gilded panels are decorative and help to scatter the light around a very dark kitchen. I have other used a similar colour pallet for both interpretations of this design but would like to see it stencilled in other colours such as white or silver over deep blue. Softer colour combinations look pretty with this design. The following illustration was made for the owner of a room that I am decorating this week, there is a huge window dominating the wall space. Had the window not been a decorative one I would have suggested that a roller blind be stencilled to continue the design when the blind was in use. However, we are choosing to go for a Chinoiserie stencil to compliment the rest of the stencil work in the room and will leave the window unadorned. Anyway I digress, back to our stencil of the week. The DE31 arts and crafts border no 30 is a popular design and I am surprised that I have not received photographs from our customers showing what they achieved with the design. Anyone??? We do enjoy seeing pictures of your stencil work. Ideas for butterfly inspired decor and a special offer. With each Moths to a Flame stencil (codes BU2,BU3,BU4) purchased in December we will add a free assorted butterfly stencil in a size to match it. Nice huh? Here are some ideas to inspire you to create something fab with your butterfly and moth stencils. Stencil the shapes onto cardstock, cut, fold and hold with a tiny piece of tac for wall or ceiling decor. Alternatively, use the stencil in the conventional manner straight onto a wall, ceiling, floor or other chosen surface. The butterfly circlet is perfect for creating a ceiling rose or decorating a round table or cloth. When either the circle of butterflies or the repeat stencil is bought between now and the end of 2013 we will give a stencil of BU1 assorted butterflies in the matching size. It will be added to your parcel when we despatch your order. There are so many uses for this versatile butterfly and moth stencil. My shoes are in the picture to give an idea of scale. The Stencil Library sells paints that are washable on fabric enabling the decoration to be applied to curtains, blinds and soft furnishings. The butterfly repeat stencil can be very effective when placed inside another shape. A pin board could be decorated, or boxes and furniture. The small butterfly stencil is a perfect size to stencil cakes and stationery. I have added a picture of this poster from RE-found objects.com. Apart from looking good in a frame it would make a handy reference if hand painted details were to be added to the stencilled butterflies. What would you do with your set? Our new, large, damask stencil appears in the September issue of Homes & Gardens magazine. The damask pattern was stencilled with white paint onto pale floorboards so is very difficult to see in the photographs but I imagine that it looked stunning. Here is an illustration of the stencil from the Gothic section of our web site. In addition to the stencilled floorboards we have repeating designs in both the Vintage and the Modern collection that give a similar graphic pattern to the rug featured in the same picture. Stylist Claudia Bryant used Cornforth White floorpaint from Farrow and Ball to decorate the floor. The same damask stencil will give dramatic impact when stencilled onto walls even if a similar, white on white scheme is used. Graded stipple colour can give a stronger, yet soft and muted effect . A strong contrast such as slate grey or indigo and white would look striking with a large pattern such as this. I would like to see it stencilled in bright or neon colours...but then I am like that. an enlarged version in an explosion of colours stencilled by me. Rachel Egglestone and Sabina Rose. I should have featured this spaceman stencil with my recent post about the forthcoming sale of Richard Hamilton's Man, Machine, Motion panels. This is VN222 Spaceman from the Vintage Collection at The Stencil Library. I like the way that the design looks both old fashioned and futuristic. Apart from making great wall decoration this spaceman and rocket stencil would look splendid as a decorative ceiling or even a painted floor. Vintage spaceman is a fairly detailed stencil and has three overlays. The stencil has been designed to repeat in all directions. Alternatively the different elements could be isolated and used as motifs. The standard size of the design is offered at 22.2x16.1 inches ( 569x409mm). To give you an idea of scale the spaceman measures 15.5 x11 inches (393x280mm) but other sizes can be cut. Beam me up Scotty. make it formal, pretty and pastel. The colour and placement of the stencilled motifs is your choice. For a denser, regimented, floral pattern try VN153 Lilies from the Vintage Collection. The design is based upon the CO15 Lily stencil but has repeating marks to help form a pattern. This beautiful, stencilled floor was created by Sandy Gunderson of A Visual Feast inc, Alberta, Canada. She used the VN153 lilies stencil. There will be more about Sandy and her amazing stencilled floors in a forthcoming 'Featured Decorative Artist' post. 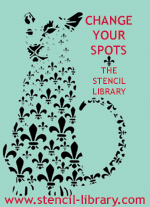 There are many stencils of lilies in our collection at The Stencil Library. They include border stencils, motifs, repeat designs and panels. To see a selection. Just type lily into the stencil search on the site. The stencils are designed and made in England and sent worldwide. Let me show you how to stencil china using a simple technique and introduce you to stencil no 297 rose solo. The rose stencil is a sweet, two layer design based on the traditional folk art roses found on canal barges and narrow boats. Traditionally they are painted in bright red, yellow and white over a dark base colour similar to the way I have stencilled the wooden storage box. I have chosen to interpret the same design onto crockery using magenta and turquoise china paints. I have a draw full of glass and ceramic paint. They are the kind that you fire in a home oven. I find it easy to use sponges when stencilling this kind of motif onto china. I cut a foam square into four and used a different piece to stencil each colour. Tape the stencil into position. Not all parts of the stencil will lie flat on a curved surface. Concentrate on applying paint to the secure area then press the next part into position whilst releasing the area that has just been decorated. Gather all corners of the sponge square to create a firm, smooth paint applicator. Take paint from a pallet by dabbing the sponge onto it. Further dabbing onto a clean surface ensure that the paint gets evenly worked onto the surface of the sponge and is no longer wet. Rock and dab the paint lightly over the stencil. Roll and release the stencil until the pattern is complete. Before applying the top layer of pattern the stencilled china will need to be fired. Follow instuctions on paint pot. Mine read 45 minutes in moderate oven temp. After removal from the oven wait until the piece cools thouroughly before matching the second stencil over the previous decoration. Dab, rock, roll and release as before then put it back in the oven to fire the top layer of paint. This should give it a dishwasher safe finish. In addition to the decoration of crockery and furniture I like the idea of stencilling this rose design in a haphazard fashion over a wall or fabric. Possibly condensed in one area then scattered randomly over the rest of the area. There are other barge painting stencils in The Stencil Library's 'Special Interest' collection. I'm looking at a stencil of a love-heart tattoo and imagining decorative potential for Valentine's Day gifts. It is big enough to embellish a cushion cover or tote bag. I could stencil tee shirts, napkins, tray cloth, cotton handkerchiefs or gift bags. I could customise a gift box, files or a book cover...a photo album might be a good subject. Or, I could just give the stencil and let the recipient have the choices. In 2011 Rachel introduced us to this week's featured stencil, VN160 Octopus stencil. She nick-named it Ned and stencilled a fabric ottoman with it. Ned was featured again in her art deco lounge. I thought it time to revisit Ned. This is a custom size stencil which has been combined with an alphabet from Stencil It. You can find him in the Natural World section of stencils in the Vintage Collection at stencil-library.co.uk. I think Ned looks really handsome in white against the gray background. So far this week a Ned Octopus stencil has winged it's way to Australia and one to America. Bon voyage sweeties.